Every time I hear the word 'winter', I often think of snow! Since there is a zero chance of snowfall and it doesn't get as cold as the weather up North, I usually get my dose of "winter fun" at the indoor snow park and in the ice rink. 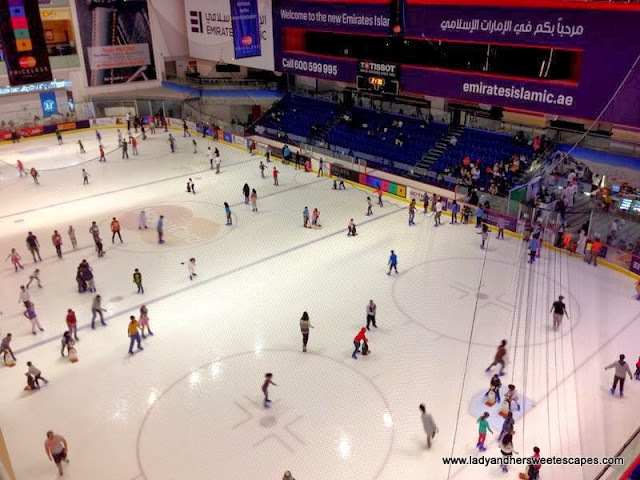 Skating, skiing and making snow angels are actually available in Dubai all year round; even at the peak of summer! I just get to appreciate these activities even more during the cold season, when I'm finally on my knitwear and boots. I went skating at the Dubai Ice Rink last weekend! It was my first time to be in an Olympic-size rink. I learned how to skate on my own at a smaller venue with lesser spectators at the now defunct Stargate. So being at the prime ice rink in the city, armed with only the basics of skating, was really nerve-wrecking. Ed and I, together with two of our friends, went for the 2-hour public session. People were already flocking at entrance when we arrived. The queue was bearable, so after a few minutes, we have already paid the fee. The 55 AED fee includes a pair of skates and the entrance to the rink. 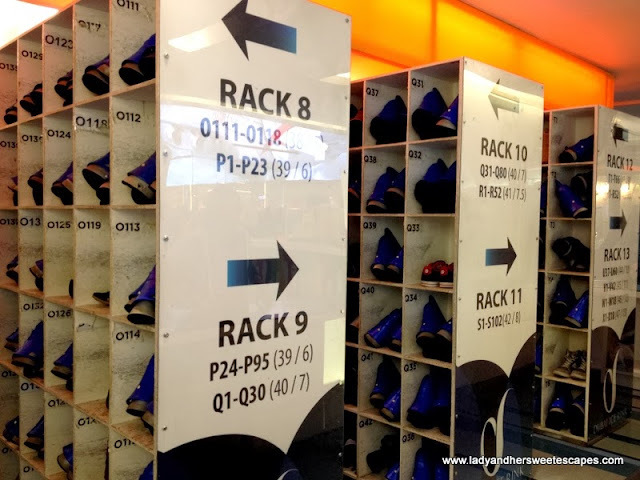 There are various add-ons; a locker for 30 AED (20 AED refundable deposit) and a skating aid for 30 AED. The skating aid is in the shape of a penguin. It is actually called a Penguin Pal, basically for a child to hold on to while skating. We went to the ice along with some kids holding on to their penguins. 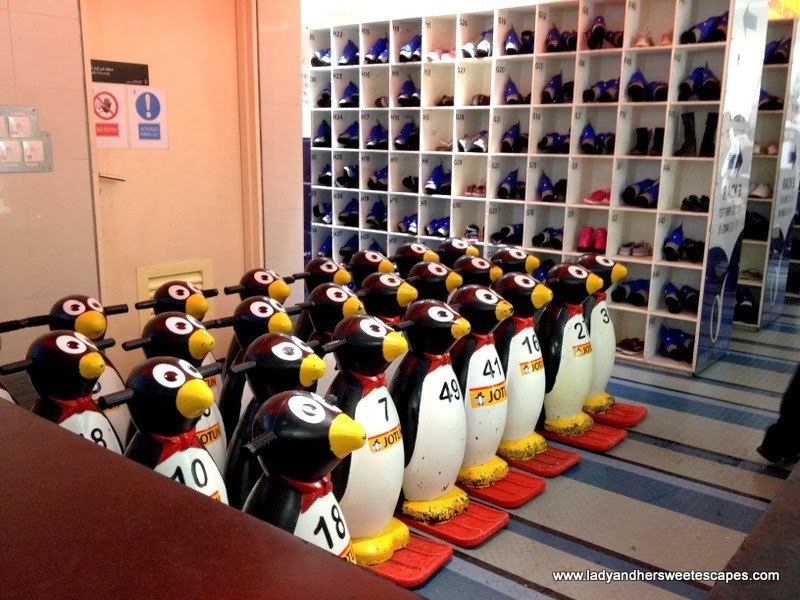 I hoped there's a skating aid for adults as well, probably in the shape of a king penguin or Santa Claus! Oh that would be funny and strange! 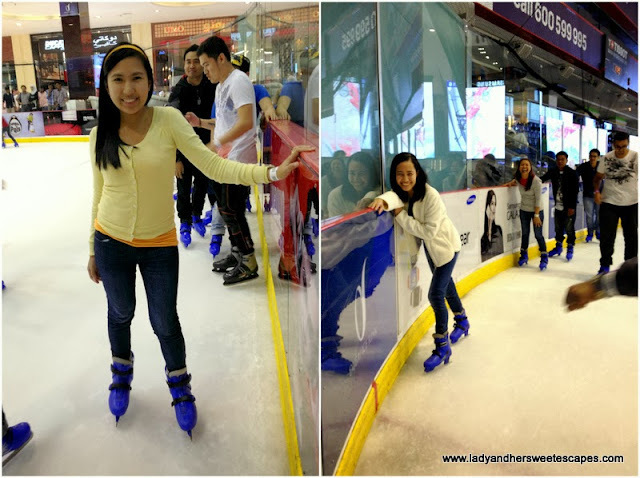 It has been almost two years since I went skiing at Ski Dubai, so I glided near the wall, holding on to it from time to time, while I was finding my balance. I had one round at the side, followed by another without support, then I surprisingly found myself at the center of the massive Olympic-size ice rink! Though I'm not an expert skater, I love being on ice. It gives me just the right amount of adrenaline! I do love to speed it up a little, but still too scared that I might loose control. So, I was always in my comfortable 'nice and slow' pace. 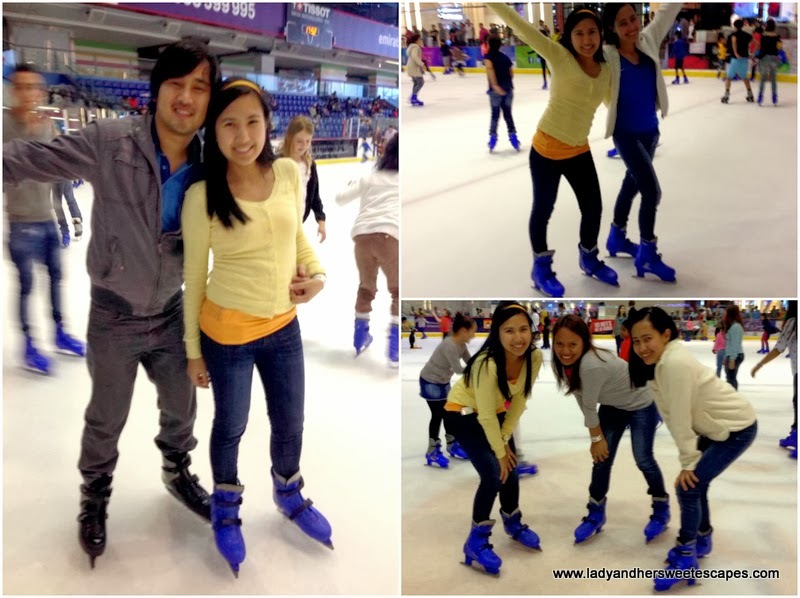 We slowly skated our way to the center of the Olympic-size rink! 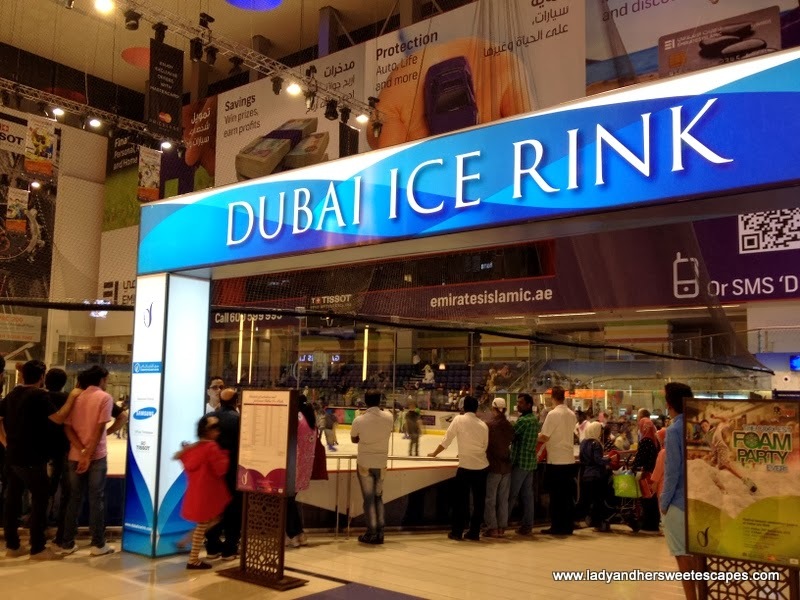 Dubai Ice Rink is a skating venue for all types of skaters. It's too huge that it can accommodate both beginners and experts. It is where you can learn how to skate and be inspired to do better just be watching skaters gliding around you in circles! I think you'll find it easy kasi it's almost like rollerblading. 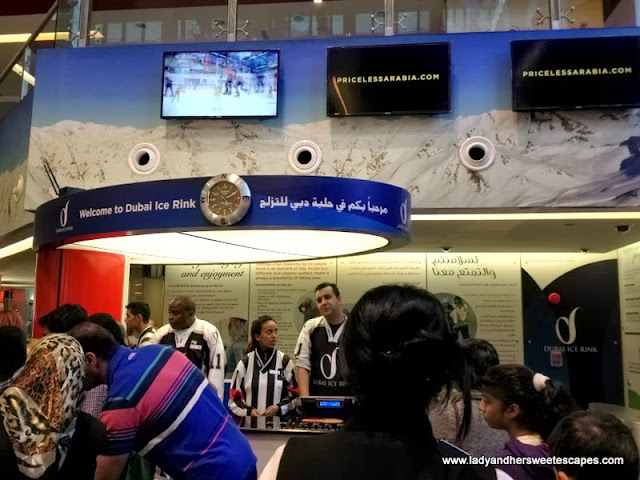 Try Ski Dubai din. 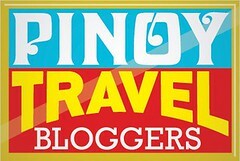 :) Masaya, promise! Hahaha! I think! Me and my friends should try it sometime. It look so fun! Look like you had so much fun, That is very cool that Dubai has it and never been that mall coz when I was there before its still under construction, I've heard that mall is ginormous, Dubai is a nice place to visit. I love watching Ice skating competitions. I remember Michelle Kwan's performance which is really great. Huhuhu! I'm so inggit. In sha Allah we'll come to get more and enjoy the beauty of Dubai. That's cool, I wish I know how to skate kaso pati roller skate hindi ko marunong hehehe.. Merry Christmas!